JP: “The Monkey Coat” deals with duality and identity, which brought to mind, for me, Jekyll and Hyde. Whenever June tries to be with Andrew (who is referred to as a good guy), she loses time and wakes up next to Randall (the bad guy). Whether these connections were intentional or not, I’m curious: to what degree do you take inspiration from classic horror fiction, and if you do, then how do you take that inspiration and use it to create something new and fresh? DB: In “The Monkey Coat”, and most of my fiction, there is no direct, conscious inspiration. I intentionally added the word “conscious” because I’ve read many stories of people “doing strange things in the night”, things that are different or opposite from their “day time”. So I see how the story readily evokes Jeykll and Hyde. One story that comes to mind with this question is “The Saga of the Alien Costume” storyline from Spider Man comics in the 1980s. In those comics when Peter Parker is wearing a new black costume he becomes stronger and the costume is seemingly the cure for all his problems. However he becomes more violent, experiences lost time, and finds himself waking up wearing it when he had no memory putting it on. It is ultimately revealed that the costume is more than is perceived and has been affecting him. While it is a very different story and kind of story than “The Monkey Coat” I can not help but notice that the similarities are there. I can’t think of one at the moment but I am sure there are many folk tales from around the world that are also similar. One approach to making a classic monster (or something classic) fresh is to intentionally very one of the key elements of the trope. Terry Bisson told my class that as an exercise every new author should try to write a story with a “classic” monster in it and make it their own by changing up one of the tenants in it. My attempt at doing this is the story “Resolution Seventeen” in my collection The Wish Mechanics. Especially at the time I wrote the story vampire stories were particularly tired. I tried to play with the elements of the effect of sunlight and the need for blood. When thinking these through and exploring and pushing how they could be dramatized, I came up with something different. So while the story might still be “horror” because it is a vampire story it steered towards science fiction because of the context and the choices the characters were faced with. Somethings that keeps stories fresh to me (both as a writer and reader) are reversals of expectations and subversions of tropes. I’m not talking about stories where there is a big “reversal” or “water cooler moment” or reveal that has almost become a television show trope. I have been learning about the horror genre and its history to have a better idea of just what was and what is thought of as a horror story in order to know the tropes and expectations. I knew very little of this when I started writing but I feel educated myself in this way is allowing myself to write with greater awareness and control, be it in a “standard form” or an intentional subversion or exploration of the form. The film “It Follows” is one of my favorite examples of a story that plays with genre, expectation, subversion, and form. The movie on its surface looks like and appears to be structured like a teen-aged slasher or jump-scare but it pushes and subverts common expectations and norms of such a generic (or standard form of such a) movie at every turn. The Neon Demon is another of my favorite movies that plays with expectations and in doing so makes something that could have been common and generic into something fresh and original. The characters in the Neon Demon are depicted in shades of grey differing widely from where a generic story might keep the characters on a familiar arc. JP: This story also offers some unanswered questions about the identities of Franklin and Randall that led me to wonder whether they are somehow the same person. When you write a story where there are mysteries left open or unexplained, do you typically know the “answer” to the mystery in great detail (even if you don’t share it), or are there some things still mysterious even to you? How important is this sense of mystery in a horror story? DB: I really love this question. I’ve done my best to try to answer it directly without a huge tangent on Robert Aickman. Franklin (a man June was involved with and the murder victim we are told about on the opening of the story,) and Randall (one of the men June is dating) are not intended to be literally the same actual person but they are intended to be presented as the same “kind” of person; both men that are harmful to June that she seeks to disengage from. They are both men that do not respect women, men that do not respect June, yet men that June is still drawn to. Change can be defined as being faced with the same choices (or same men) over and over and making different decisions. They were included in the story to define the June’s choices and what is at stake for her. As to how important is a sense of mystery to a horror story the short answer is I think it is a matter of taste. I’ve noticed in what I am referring to as “traditional” or “standard form” horror stories mystery is not an essential element. A horror story will still be a horror story even if there is no sense of mystery. A vampire story will still be a vampire story if everything is known. For example in Salem’s Lot by Stephen King the reader knows that the traditional “rules” of vampire stories are in play. There is no mystery in that regard. And it is still a very, very satisfying story. At least in that way Salem’s Lot is a traditional horror story. In contrast, Stephen King’s IT, moves away from a traditional horror story in some ways. The creature in IT, is not a named thing. It is not a monster that we know of and know the rules of how it operates such as one must kill it with sunlight or a wooden stake such as a vampire. We readers are eventually given some rules regarding the creature but I think the story operates as a good illustration of a story with the element of mystery you mention in your question. I think stories with that element of mystery still are under the umbrella of horror but are also interstitial and perhaps are closer to the weird fiction genre. I think a sense of mystery and lack of an explanation for the supernatural is a hallmark of weird fiction or at least is something more often seen in that category. While I enjoy stories with a sense of mystery and unexplained elements I don’t think it is a defining or an essential element to a horror story. Peter Straub stories often have that mystery and unexplained to them. Stephen King stories often have the rules and explanations to the supernatural. Both are horror. I don’t have a definitive answer but it is something I think about often. Your story “A Thing in the Trees” uses that sense of mystery and the unexplained in a way that absolutely delights me. JP: Following in the vein of my previous question, it seems like most of the horror in this story comes from the suggestion of something horrific, rather than what is actually shown or described, with just a few visceral details that are all the more powerful because of their scarcity. How did you decide what to make explicit and what to leave up to the reader’s imagination, and how do you think this affects the type of horror that the story embodies? DB: Because I am relatively squeamish I’ve always shied away from the overt and graphic depictions. I also feel there is a great weight and power in leaving things suggested and to the imagination. For a very long time I stayed away from reading stories by the great Jack Ketchum because I knew I would be uncomfortable with graphic depictions. Just as there is power in the suggestion I know there is great power in the opposite. Strangely enough, in this story I was trying to be as overt and graphic in my depictions as I dared. I think my own comfort level in what I’m comfortable writing worked out for the tone of the story. I do think depictions do steer the kind of horror a story is categorized as. How much this matters to any given reader is a very different story. For me and my own style and preference less is more. I know there is a wide spectrum and I’ve learned that many readers enjoy both quiet horror and the splatter genre equally. My first collection The Night Marchers and Other Strange Tales was intended as literary horror so when assembling it I had this notion in mind with story selection. I’d like to think that I decide the level of depiction in any given story is what serves the story best but I have a feeling for me it comes down to my comfort level in spending time creating the story. I have been pushing myself on this front. I’m curious to learn if the stories where I did push are perceived as being closer to horror, than literary horror or weird fiction. JP: I noticed that there is a degree of unreliability in the primary characters of this story. For instance, June keeps thinking she took the coat off when in fact she’s still wearing it, and at the end, Ivy “took it she imagined these things,” which leaves it somewhat open as to whether or not she merely dreamed the note from her mother. It seems to me that the only reliable thing in the story is the coat, which remains even when the people surrounding it die or disappear. The question of reliability of characters or narrators is a classic element of horror fiction, creating a sense of uncertainty over what is real. How and when do you decide whether a character is reliable, and how important was the question of reliability/unreliability to you when you were crafting this story? DB: The notion of reliability was of paramount importance in crafting this story. Is it June choosing to do these things consciously (or unconsciously)? Or is it the monkey coat with some supernatural power making her do these things? Once I landed on the idea that I wanted the tension between these two notions to be the primary thrust of the story all my decisions were made to serve that. For me, the decision to decide if a character is reliable is linked to what my aims are for the story. I think about the decision and the approach very carefully before attempting to execute any level of unreliability. It is so easy to go astray or descend into un-intended confusion. My aim in “The Monkey Coat” was to deliver a story where the source of tension is between a supernatural or psychological explanation for the strange events and behaviors. I chose to start and end with information and details showing that the coat does remain in peoples lives after their stories end and after they disappear from the reader. In that way the story becomes more about the object. It is the object that was the constant with Grandma Estelle, with June, and perhaps will be with Ivy. When refining and deciding on my approach for the story one of the choices I had was to make this a story about a haunted coat. Part of me desperately want to put depictions of the violent, monkey ghosts of the monkeys who died to make the coat in the story. Ultimately I felt like that would have pushed the story too definitively in the realm of the supernatural. Even if they were presented as possible hallucinations. That element was potentially too loaded in either direction and thus I did not go with it. As close as I came was the line about June thinking she sees something in the trees. I felt a better aim of the story was to play with the tension between psychological and supernatural and to keep that unexplained with elements that could go either way all the way through the end. It was hard for me to present a story where the characters aren’t as dynamic as I am used to presenting. June does want to change and perhaps she changes for the worse or perhaps her agency has been taken from her. Ivy is depicted as more of a dynamic character as she ultimately does change her circumstances. I think there is also a horror in whether characters are dynamic or not. Whether their endeavors to change are thwarted or realized. Ending on the scene where it is revealed that Ivy still does have possession of the coat I think may have pushed the story at least on a surface level back to something that appears to have a traditional shape- the structure of a haunted object story, as it begins and ends with the object being passed along in a way. There is a horror in the notion that June has possibly / likely failed in her desire to change. And a threat that Ivy’s change might be undermined by the coat in some way. I think that you said it in an excellent way in your question, that unreliable characters can create an uncertainty over what is real. That uncertainty in this story is essential to the story depicted and possible outcomes for the characters. Daniel Braum’s fiction has been classified as fantasy, science fiction, and horror but he prefers the good old fashioned term of just “fiction”, which when he was growing up simply meant a story were anything could happen. His stories frequently defy category and reside in the fuzzy areas between genres, utilizing and combining genre elements to produce tales that are wholly unique. He is the author of The Night Marchers and Other Strange Tales, his first collection of short stories, published as an eBook by Cemetery Dance Publications and as a trade paperback by Grey Matter Press. A illustrated, limited edition book of his stories titled Yeti, Tiger, Dragon is due out in October 2016 from Dim Shores Press. He lives in Long Island, New York and often wishes he was at Brisbane’s Punjabi Palace eating chicken tikka masala after a Thursday night reading at Avid Reader. Nightscript 4 can be purchased direct from the publisher and at Amazon. This is the time of year—you know the one. When the leaves turn and the air makes its subtle shift into fall. But not here. These are the brutal weeks, the drought’s revenge. Fool me once, okay, surely fall is just around the corner. Fool me twice, shame on me for forgetting there is no fall in the land of always summer. These are the weeks, late August and September, when you think summer is over, but—surprise!—it isn’t. These are the weeks of hellish heat. Of sweat-slicked hours and lukewarm showers. My thermostat can’t keep up; the red line is off the edge somewhere past ninety. My AC unit can’t keep up; the heat absorbs cool air in its sedating trance. The bare floor bakes. The heavy soporific sponge of heat yet prohibits sleep. Elsewhere, the world slides into autumn, slides towards beautiful death. I can’t breathe. My brain is soup. And where is the cool reprieve of sleep? Not here. My skin sweats and sloughs off. My muscles melt. My soul oozes out between pores. My volcanic heart runs lava through my veins. My eyes burn out of my skull but still I cannot close them. My neighbors turn to skeletons. They float among drowned termites in chlorine. Our pipes evaporate. Two ants feast on the corpse of a third, hungry, mindless, gnawing life away. Trees curl up and die, dry, clawing for the scorched blue sky. The neighbors steam and sink and lie on the pool bottom’s concrete. Then the dust on the cars, in the windows, on the streets. Coffee ground grime in the cracks of the earth. We water the dead while the living drink their own sweat. Then the fires on mountaintops. We burn, but we don’t die. We slouch on, live, charred. We feel we must be dead, we feel we missed the freeway exit somewhere back there, and we live but we are not alive. The air is ash and we burn and we listen for the fine soliloquy of death. It never ends—but we forget that it does. As all things. And when it does, we drink the cool and bask again in the lustful gazes of our neighbors. Our lizard skin grows back. We breathe the fine clear air and sweep away the dust. And we forget how we ever felt anything but this, anything but this alive. Hamlet never tells us the subject matter of his reading material, but I’m guessing he wasn’t about to say, “The matter is whatever you want it to be” or “These words mean whatever you want them to mean.” In fact, one of the best comic devices used by Shakespeare (and his clever character, Hamlet) was the pun, which can only be funny if a word has a specific meaning—or, rather, double-meaning. But we do not live anymore in Shakespeare’s time, and I’ve noticed a disturbing trend in modern culture: the idea that words and language can mean whatever you want them to mean. This seems to me an effect of poor critical thinking, the current “every opinion is sacred” epidemic, and the narcissism pervading social media such as Facebook, Twitter, and Instagram. No one needs to look to experts anymore because we all have the internet, so doesn’t that mean we’re all informed enough to come up with the right answer to any problem ourselves? Let’s look at this issue at a linguistic level. My example here will be the word “blessed,” or, to put it into a context every Facebooker will understand, #blessed. Picture of a couple moving into a new house? #blessed. Got a promotion at work? #blessed. Made a really good soup for dinner after your husband went to the grocery store? #soblessed. I recently read an article explaining what is wrong with using #blessed in this context: the idea that because you are privileged enough to live a comfortable life, the hand of God must have chosen to grace you, specifically, to receive these blessings. The insidious underbelly of this idea brings up the question: what about the poor and the hungry? Are they not worthy? (In the Bible, these are actually the people who are being called blessed—not those with material comfort). “Blessed” brings with it a wholly different connotation than, say, “grateful” or “lucky.” But when someone tries to write an article explaining how this blatant humblebrag also ties into the sinister idea that those who are well-off deserve to be so by divine order, there is immediate backlash in the comments from people who refuse to entertain criticism of something that they do or say. And here is my problem. A word does not mean whatever you want it to mean. If we go by this logic, I can claim that “blessed” means “cursed” or that a “chair” is actually a “table.” Now we’re getting into a problem of semiotics, and I’m sure Saussure would roll his eyes our bumbling misapprehension of sign, signifier, and signified. Regardless, you could never convince this person that “blessed” doesn’t mean whatever she wants it to mean because that’s her opinion and, remember, every opinion is sacred! Everyone is entitled to her opinion, but opinions are not facts and no opinion should be treated as fact, unless there is solid evidence to back up the validity of said opinion. Opinions are wonderful things to have, but they are by no means sacred, and they should by no means be unchangeable. Many people cling fervently to their opinions under the assumption that their opinions should not ever change. Yet isn’t it the mark of intelligence to be willing to change one’s ideas based on new evidence and experience? Just because you’ve used a certain word in a certain way doesn’t mean you can’t look in a dictionary and change your mind about the definition based on the evidence given by good old Webster. It doesn’t mean you can’t rethink the way that you use certain words and what unintended effects or meanings you might be delivering by using them in that way. Language is organic and fluid, but words do have specific meanings; they don’t meant whatever you want them to mean. If that were the case, then my life’s passion (writing) would be utterly meaningless. I would never be able to convey a single coherent idea to anyone, for my readers could simply decide that my words mean something else. Sure, people have created the meanings of words because we created language; it is a wholly human construct, a way of rendering reality in a logical way, by an agreed-upon code. But you cannot deny that words carry meanings, resonances, and ideas. Who wants to live in a world where no one is able to communicate with anyone else? We would all be alone and disconnected, screaming pointlessly into a deaf and uncomprehending void. Must a writer always have a drink in her hand? No, but it sure helps. Coffee and wine are a writer’s best friends, depending on the time of day. We can easily imagine a writer hunched over her desk with a blistering cup of coffee or a glass of red wine. Both seem to be quintessential artifacts of a writer’s life. In college, wine was my drink of choice, mostly because I never drank coffee. Yes, I was that rare breed of student who never pulled an all-nighter, was always well-rested, and had her essays done on time. I had no need for coffee. I liked to write in the evenings, when my school work was done, and this was best done accompanied by a glass of wine. Liquor has that wonderful uninhibiting effect that frees your creativity. Let loose, write whatever comes to mind! It’s easy to feel stymied by your own inner critic, and liquor certainly does quiet that voice and let you run wild. We could theoretically substitute any liquor here, in that case. So why wine? Well, I suppose wine makes us feel classy. Writerly. Dignified. Everything looks more elegant with a glass of wine, doesn’t it? Plus, it doesn’t get you drunk quite as quickly as, say, a glass of whiskey, so you can loosen your mind without immediately putting it to bed. On the other hand, wine makes me sleepy. At some point, after college, my writing clock reversed. I could no longer write in the evenings; now, my best writing is done in the morning or early afternoon with a cup of coffee. Perhaps I’ve become solar-powered, that the morning sun recharges my writer’s batteries. But my writing ritual just can’t get off the ground without coffee. What’s great about coffee is its ability to induce a laser-like focus, energy, and intense joy: the perfect creative concoction. I can literally be wallowing in my own mediocrity one moment, drink some coffee, and suddenly believe that I am a literary genius. This inflated confidence, similar to the uninhibiting effects of wine, can soften the self-doubt; the energy can get your fingers running across the keyboard; and the focus allows me to lose myself in a story for hours at a time, barely resurfacing for air (or food). In fact, being hungry helps, too. I’m never as inclined to write when I’m full. This is terribly inconvenient for someone who is trying to put on weight and also finish a novel. Strangely, the uncomfortable effects of coffee (or hunger) seem to feed my workflow. Ever since I quit my job at Starbucks, if I have more than one cup of coffee, I am immediately a jittery mess. Well, bring it on. This is the perfect way to write: when my body is vibrating so much I can’t keep still, and it all comes out through my fingers. Wine makes me too comfortable. That’s death to my writing. It’s the discomfort that keeps me going, the drive to push on, push on, that you just don’t have when you’re feeling wonderfully complacent (or full). The discomfort of being overly caffeinated has spawned some of my greatest writing binges to date. Maybe some writers need to feel cozy and at ease to do their best work. Me, I thrive on the discomfort. I suppose if my anxiety is good for anything, it’s that. What else drives us forward but that feeling of discontent? I think writers exist in a state of constant dissatisfaction, and maybe this is where great work comes from. The need to always be better, improve, create a more pleasurable life. Of course, once we’ve found our pleasure, inevitably, we will need to find some other source of dissatisfaction to draw upon for the next great work. Whatever your poison, it’s best to know what works for you. Perhaps you are one of those writers who cannot work with any type of liquid elixir. All I know is, I’d better go have another coffee, because I have some writing to do. Recently I taught a creative writing lesson to a group of high school students about creating and mapping fictional places. The kids loved it; they came up with some wildly imaginative places (one of them includes a military base with no doors, an inactive volcano, and an entire town fenced in by barbed wire). Then they wrote stories taking place in their towns. Type 1: Fictional towns, cities, countries, and continents that take place in another world from our own and have no connection to our reality. 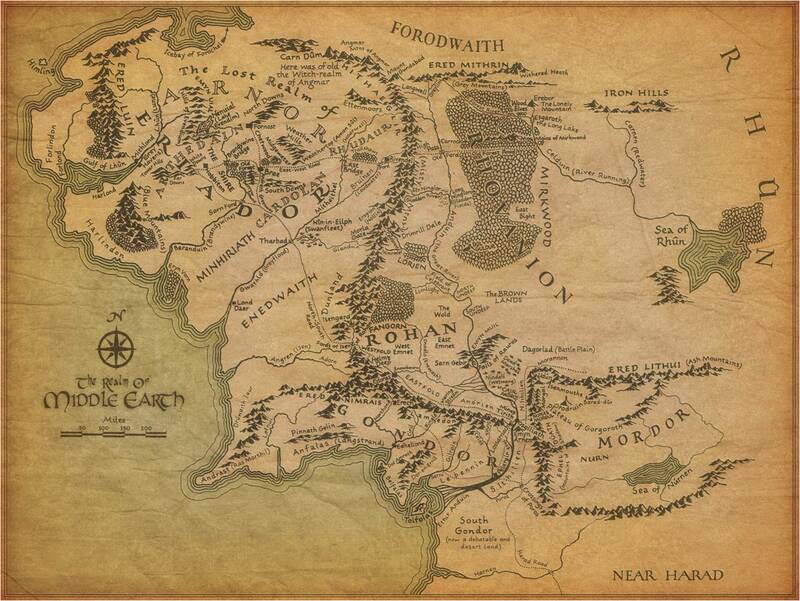 Some examples of a type 1 fictional setting include Westeros from Game of Thrones and Middle Earth from Lord of the Rings. Often these kinds of places are used for fantasy novels, although I would also include the setting from Star Wars here. China Miéville also utilizes this kind of fictional setting, and he does a fantastic job of world-building in his vivid, surreal writing: check out Perdido Street Station to see what I’m talking about. Type 2: Fictional towns, cities, countries, and continents that take place in another world from our own, but which can be accessed through our reality. 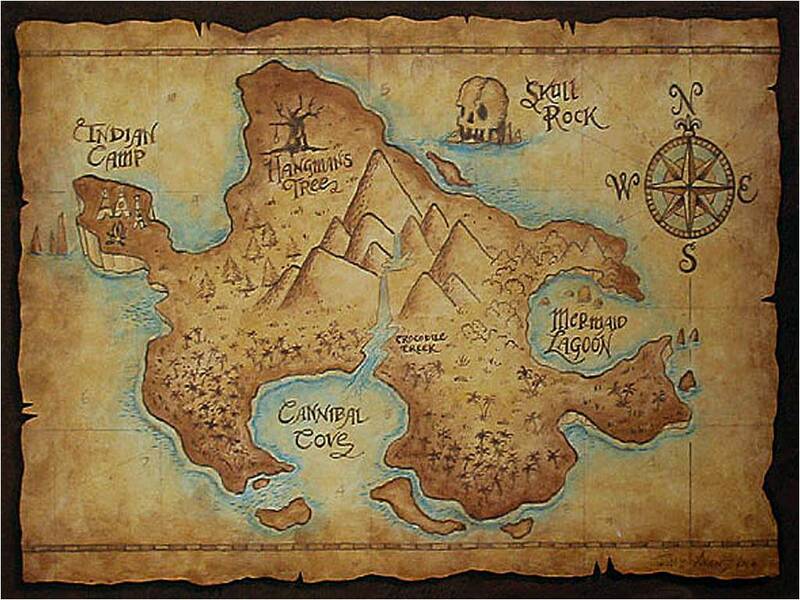 In this case, the reader is introduced to the fictional land by way of the real world, usually through some magical or unusual form of transport. For instance, in The Chronicles of Narnia, we start out grounded in the real world; then we go through a wardrobe and arrive in Narnia. This technique works well to introduce readers to these purely fantastical and imaginative landscapes by taking their hands and transporting them away from their solid footing in the real world. 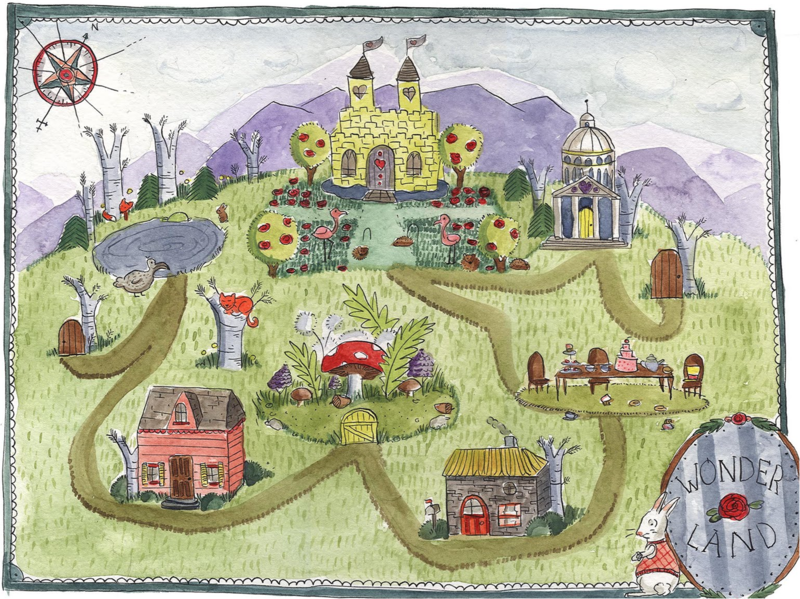 Children’s stories often use this type of fictional setting because it is easier to grasp than a type 1, where you are thrust without context into a strange new place. Here we begin in the real world (London), and then Peter and Wendy fly off to the fictional realm of Neverland. Type 3: Fictional towns and cities in real states/countries in the real world. While the other two types of fictional places are largely used for speculative fiction in the science fiction and fantasy genres, this type is used more frequently by writers of all genres. Being in the real world, the cities and towns of a type 3 place must therefore abide by at least some laws of reality. Thus, writers from Stephen King to William Faulkner have all created imaginary towns in the real world. I had a blast teaching this lesson because, over the years, I’ve acquired an increasing interest in fictional cartography. Each novel I’ve written takes place in a type 3 fictional setting. 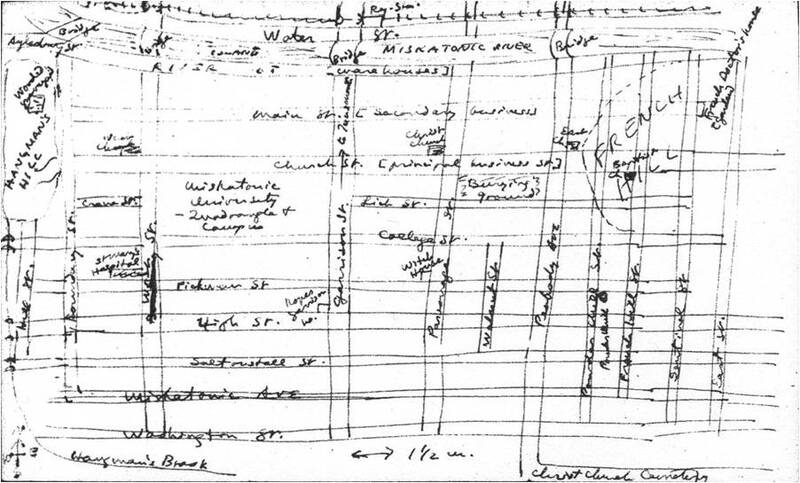 Like Lovecraft, I’ve found myself sketching out these places, crafting them for my readers, my characters, and myself. This is why the towns from my two in-progress novels feel much more real to me than my first attempt with Pandora‘s Sickle Falls. Unfortunately, Sickle Falls feels half-complete because I never mapped out the town itself. Hopefully these novels I’m working on now will be published in the future, and you can see for yourself how real the places feel. Let me transport you to Bryn Du Bluffs, West Virginia, where legends of an evil cemetery on a hill and the ancient Moon-Eyed People spook the superstitious folks in town. Let me take you to Rockhaven, Nebraska, where abandoned farms become the playground of meth-heads and an old crone guards her haunted well. Let me take you there. These places have become real now. They’re all mapped out… and waiting for you. As part of the final project for a class I recently took, which focused on various aspects of the writing life, I was instructed to compile 10 commandments for writing well. Each student in the class made a list, and each one turned out different from the next, proving that there is no one ideal method for how to write. We took our cues from similar lists made by established writers, such as Elmore Leonard, Neil Gaiman, John Steinbeck, Joyce Carol Oates, Kurt Vonnegut, Margaret Atwood, and Richard Bausch. You can find a few of these lists online, perhaps at the websites of these authors. Reading and discussing the lists helped my class to understand that these are not hard and fast rules for writing. Some writers contradict each other; some tell you not to follow rules at all. These commandments are for the writer who made them. So I want to preface my own list by saying that these commandments were written for me. They are things that I’ve learned over the years, which have helped me become a better writer, and which I try to adhere to. They won’t work for everyone. But maybe someone else will stumble across this list and find it useful. Maybe they’ll work for you, too. 1. Forget that tired cliché, “show don’t tell.” It’s “show and tell.” Great fiction includes elements of both, and there are some things you really don’t need to show. 3. Strive not for realism but for believability. However fantastical the tale, believable characters and emotions generate the strongest suspension of disbelief, and if these elements are believable, your reader will follow you anywhere. This is so important because we must remember that fiction is never reality. 4. One good noun/verb is worth ten good adjectives/adverbs. That’s not to say you should never use them, but use them sparingly. When they can be replaced or dismissed, do it. 5. Wherever possible, allow the characters to react in the way that feels most natural to them, without trying to direct the story to where you think it should go. If the characters are functioning, the story will go where it needs to go. Too much authorial navigation can seem contrived. 6. Forget the idea that there is a muse only using you as a conduit. You are the writer, and everything coming through your fingertips originated in your mind. This is your work. Don’t forget that. At the same time, try to disengage from yourself as much as possible and allow the story to take over. 7. A one-sentence description is almost always more powerful than a three-sentence description. Say what you want to say, but say it only once: the right way. 8. Make the reader feel something. Fear, hopelessness, hilarity, love, repugnance. If the reader feels nothing, no matter how literary or well-written the piece may be, then the story isn’t doing its job. 9. Revision is just as important as writing from scratch. Don’t burn yourself out on the first draft. Let it sit for a while and come back. But make sure you always come back. Don’t let it sit for too long, or it will die. As we enter the month of September, the Halloween season is officially upon us (yes, Halloween season starts in September). 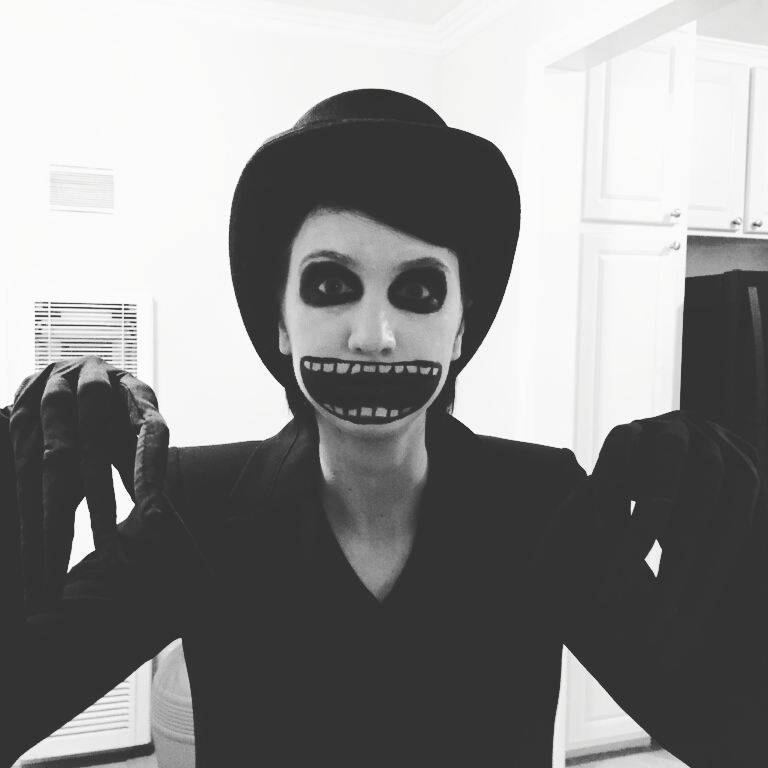 If you’re reading this, then you already know how much I love Halloween. What you might not know is that my day job is a barista at Starbucks. Ah, the corporate horror… but oh, the free coffee! And, with that, the freedom to create my own drinks. Writers are notorious coffee fiends (a writer’s best friend is either coffee or wine, depending on what time of day you choose to write. Or how much of an alcoholic you are). Horror writers are notorious lovers of all things Halloween—including pumpkins and pumpkin-flavored everything. So, with my knowledge of creating fancy custom-order coffee drinks and my love of pumpkin, I present to you my top 5 things you should be getting at Starbucks this fall that aren’t on the menu. 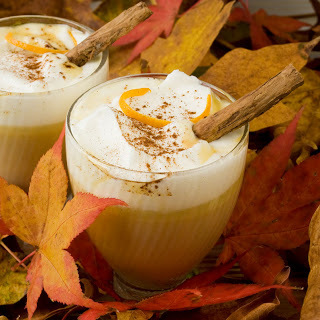 If pumpkin and orange is kind of your thing, then I’ve got the perfect iced drink for you. It’s a twist on this summer’s new offering of orange spice iced coffee, which consists of a dried orange, cinnamon, and iced coffee—shaken, not stirred. 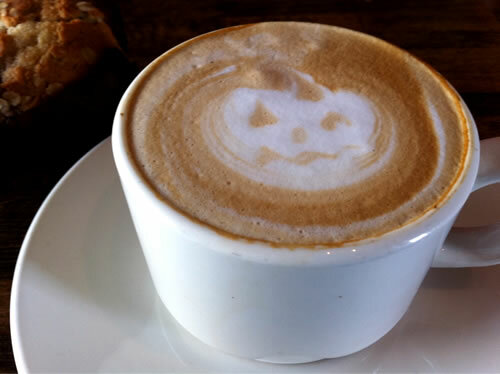 Ordinarily, this drink comes sweetened with classic syrup, but you can substitute that for pumpkin spice for a cool autumn treat. I’m drinking this as we speak, and as far as I know, my coworker recently invented it. It’s a light, refreshing, and fairly healthy coffee alternative if your fall is turning out to be like the one in L.A. (read: hot, hot, blazing hot). This is basically just the standard chocolate banana smoothie, but with pumpkin spice substituted for the mocha. Okay, now I’m just making things up. I admit, I haven’t tried this one—nor have I seen anyone order it—but hey, it sounds like a good mix, right? If you’re not a fan of the toffee nut/mocha mixture in the regular salted caramel mocha, why not put the two fall drinks together by making a pumpkin spice latte with caramel sauce and the sea salt topping? It’s the best of both worlds. Three flavors in one drink? Surely you can’t be serious! Well, I am serious (and stop calling me Shirley). It’s especially easy to make now that we’ve got our new chocolate chai drink. Just ask your barista to put in a little less of the chocolate chai and add a few pumps of pumpkin spice to compensate. Voilà! Insta-fall in a glass. If you love drinking your desserts, then look no further. This one tastes like pumpkin pie in a cup. It’s just a mix of pumpkin spice and white chocolate mocha sauce. I’d recommend getting more pumps of pumpkin spice than white mocha, since the latter is overpoweringly sweet, and you don’t want to lose that perfect pumpkin taste. It’s a creamy, decadent alternative to the regular pumpkin spice. Now that you’re armed with a few ideas, go forth and drink pumpkin! I guess you could always just go with a plain pumpkin spice latte, but if you’re feeling creative, give one of these a try. Remember, none of these are on the menu, and chances are your barista will give you a strange look if you try to order it without explaining what goes into the drink, so make sure to be clear about your custom order. It’s extra work for your barista to figure out your off-menu drink, but they will be happy to make it for you… as long as you don’t forget to tip! There aren’t enough apologies to go around for how long it’s been since I’ve made a blog post. Part of the horror of real life is when it gets in the way of writing about your love of horror. As it is, I’m currently doing a three-week workshop abroad in the beautiful mountain town of Chamonix, France, nestled in a valley between the sharp peaks of the Alps. In fact, I’m right below the tallest mountain in Europe: Mont Blanc. 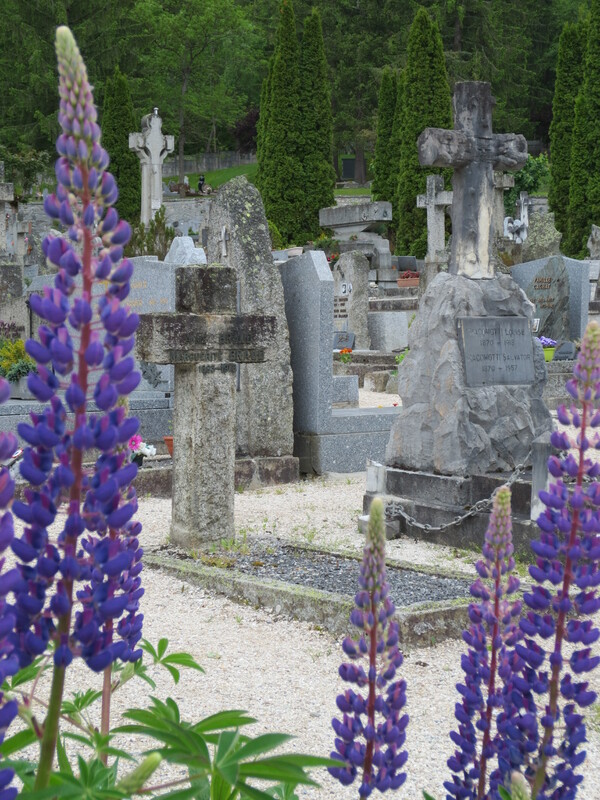 Aside from the Gothic imagery of the jagged mountaintops (currently clouded in mist) and the proximity to where Mary Shelley penned the immortal Frankenstein (just over in Geneva), there’s a fair bit of creepiness in this quaint little town—thanks mainly to the old cemetery, which is only a five-minute walk from my apartment. If you’re a fan of cemeteries (like myself), then I can’t stress how awesome this little place is. There are two sections: the “ancient” part, and the newer area. I didn’t even venture past the old graves. 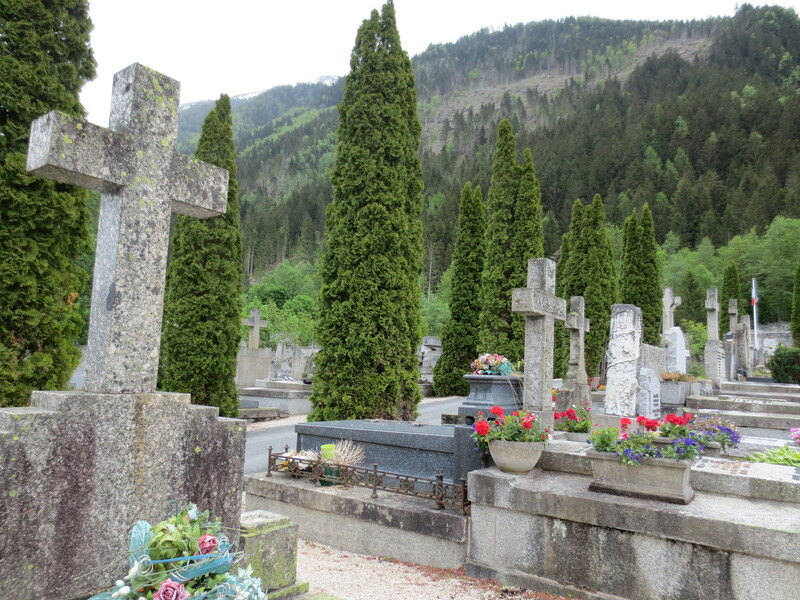 There were plenty of cool stones to see: some old, crumbling, shapeless rocks; some weathered crosses; some leaning against the cobblestone wall that encloses the cemetery. On a side note, I find it interesting that the ground of this entire cemetery is gravel… I wonder if this makes it easier or harder to keep? I’m reminded of other such oddities, like the aboveground cemeteries in New Orleans. Perhaps it’s because I’ve always been fascinated by horror as a genre, but I love discovering beauty in the macabre, and this cemetery is no exception. Yes, it is a place where we lay to rest those who’ve passed on—it is a place where the dead lay just beneath the soil—but something about it is eerily picturesque. It’s lovely, in its own creepy way. 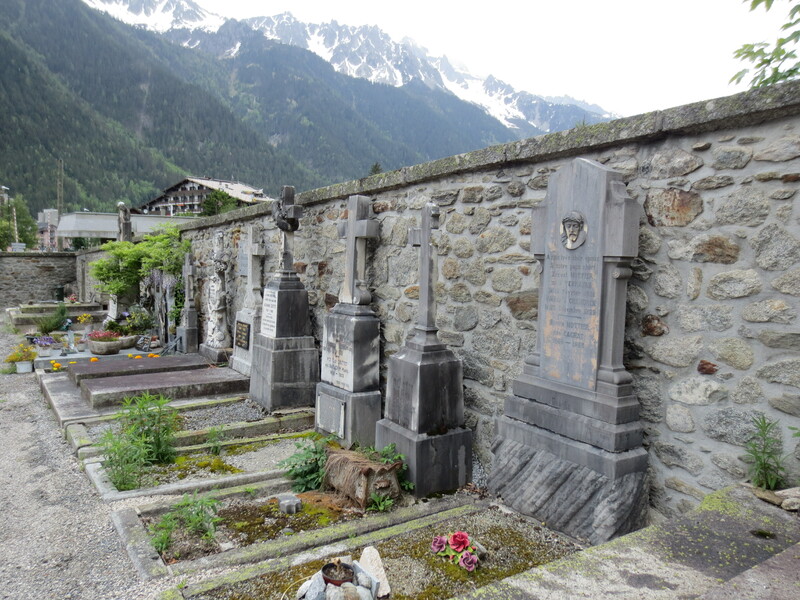 Not far from the main cemetery of Chamonix, I also happened to stumble upon a little church with a few graves of its own adjacent to the stone structure. 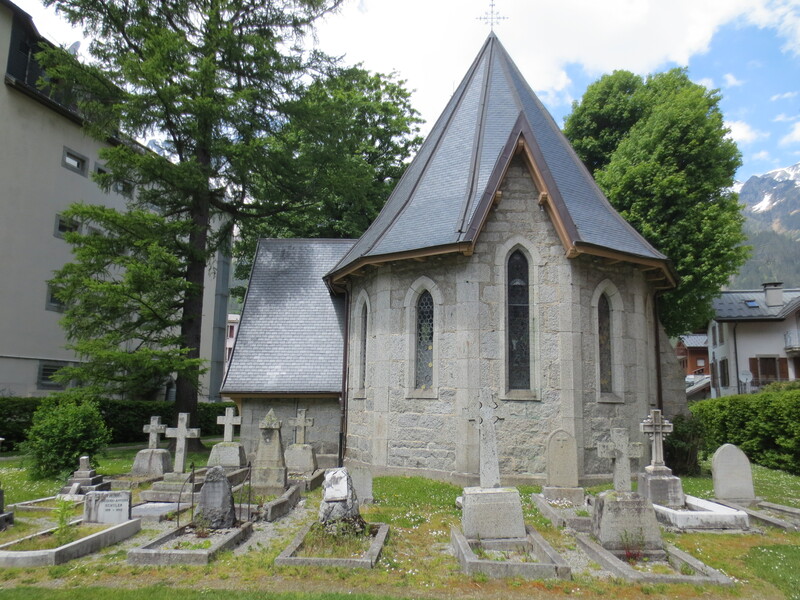 Those are the kinds of churches I’m interested in—the ones with little churchyards attached, just begging for someone to say they’re haunted. 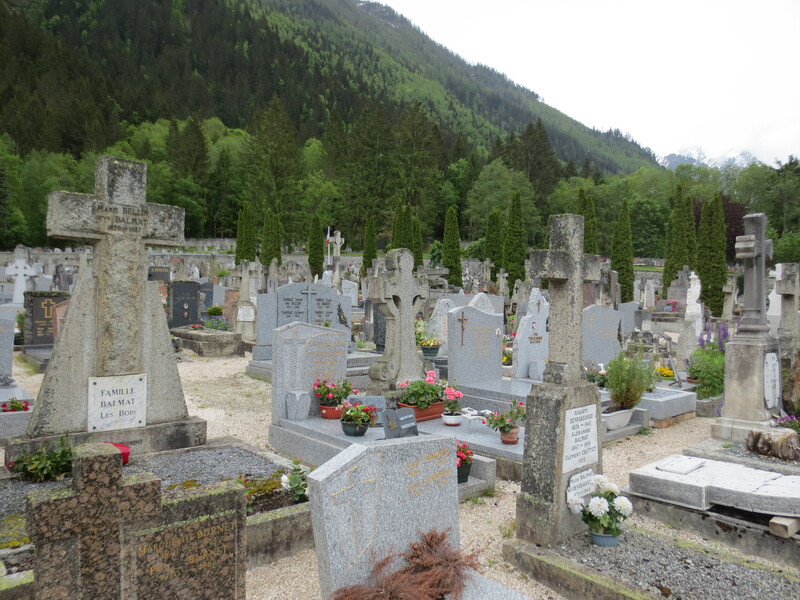 And that’s my virtual tour of the cemeteries of Chamonix, France! While I’m here, I hope to get some good writing done. I’ve been working on my new novel, which is shaping up nicely, as well as a short story about the Jersey Devil. An Afternoon of Horror: Book Signing & More! 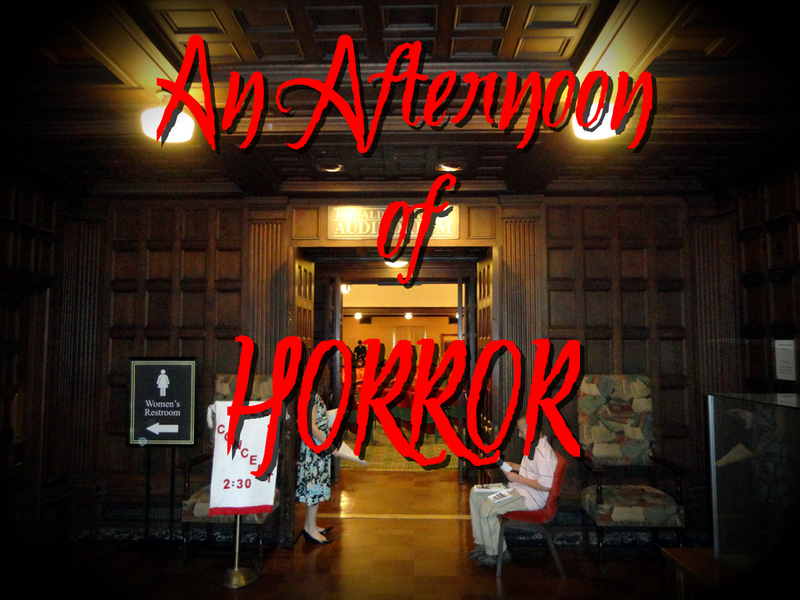 Come one, come all, and enjoy an Afternoon of Horror at the Pasadena Public Library! This Saturday, April 27th, I will be doing my first book signing at “An Afternoon of Horror,” an event run by the L.A. chapter of the Horror Writers Association. If you’re in the Southern California area, stop by the Pasadena Public Library around 1:00 pm for panels on the horror genre and publishing, and stick around for the book signings that start at 3:00. I’m joining Bram Stoker Award winning authors and editors, and there will be plenty of great books to check out. If you didn’t make it to the L.A. Festival of Books this past weekend, this is a perfect opportunity to grab some new reads! I’ll be signing copies of PANDORA, which will be available to buy for a discounted price (read: cheaper than what you’ll find online). I’ll also have some free swag such as bookmarks, pens, etc. for anyone who stops by. And if you’ve already read the book, you should come see my replica of the box itself, hand-crafted by my very own sister, Mallory Parypinski. Free panels? Free swag? Signed books? What more could you want on a sunny Saturday afternoon? See my Events page if you need the address, or join the event on Facebook. If you want to see which authors will be there, check out the details at the official Pasadena website. Trust me when I say there will be some amazing writers at this event.